"What's that building over there?," I said aloud as I drove through the Annapolis Towne Centre in Parole, MD. From a distance I noticed a very colorful display of patio furniture and a store front. 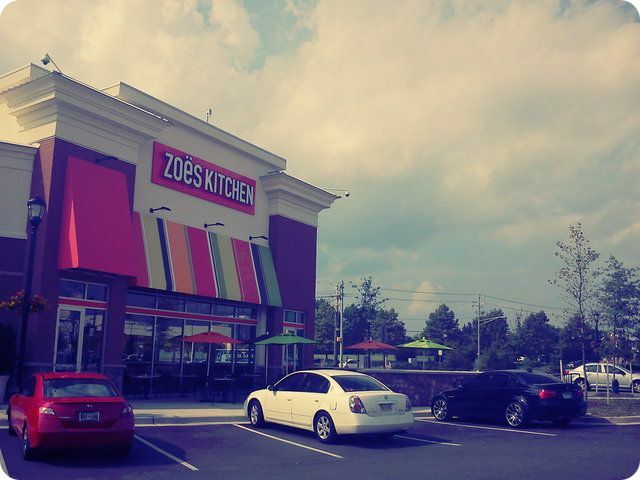 I was already curious about Zoës Kitchen before I even tasted the food. 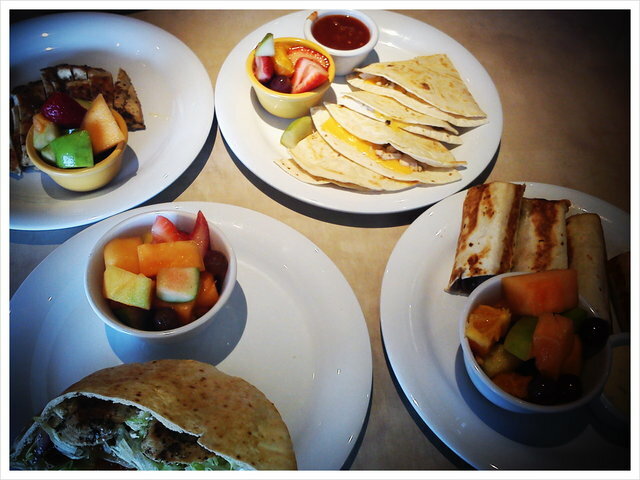 To cure my curiosity, the children and I spent the afternoon feasting on delicious meals that were Simple. Tasty. Fresh! Upon entering the restaurant, I was delighted to see the vibrant chair colors, striped walls, and art displays contributing to the inviting atmosphere. The ceilings were high, the staff was friendly (asked me if I needed help immediately), and there was an overall feeling of simplicity...in a good way. On the way to the register to order, I discovered the individual pieces of artwork created by local talent was available for sale. For $20, anyone could purchase one of the displayed artwork seen on the walls bordering the restaurant. What a brilliant idea! Immediately my eyes were drawn to the signage. There was a sign about their social media whereabouts, a sign about email sign-up, a sign bearing their slogan (Simple. Tasty. Fresh! ), and a sign letting customers know you could order online for faster service. Lots of information without having to search for it. We ordered our food, were handed our drinks, then took a seat in one of the many options for seating. You can choose a booth, a table, a tall table with higher chairs, or dine outside on the patio located in front of the store. 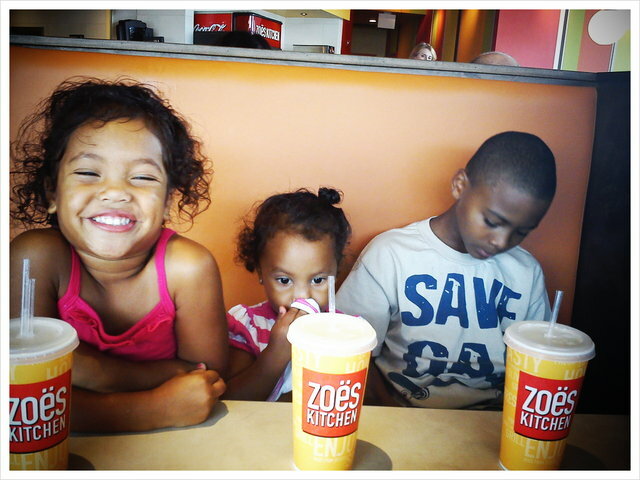 We chose a booth (high chairs are available, but Iyana wanted to be a "big girl"). Your food is then brought to you once it is ready, but there are no waiters per se. Take a look at this rowdy bunch. One can't keep her feet off the table. The other is singing Cee-Lo. Parenting at its finest. I sampled everyone's food. It was delicious. The tasty and fresh parts of the slogan were definitely honest statements. Not a lot of greasy, empty calorie consumption. There are even a few gluten-free options. At one point, the girls were fighting over fruit. How's that for a "food fight"? The highlight of the day had to be Iyana's request for grapes. At the tender age of two, she was screaming, "I want balls! I want balls!" Awkward! 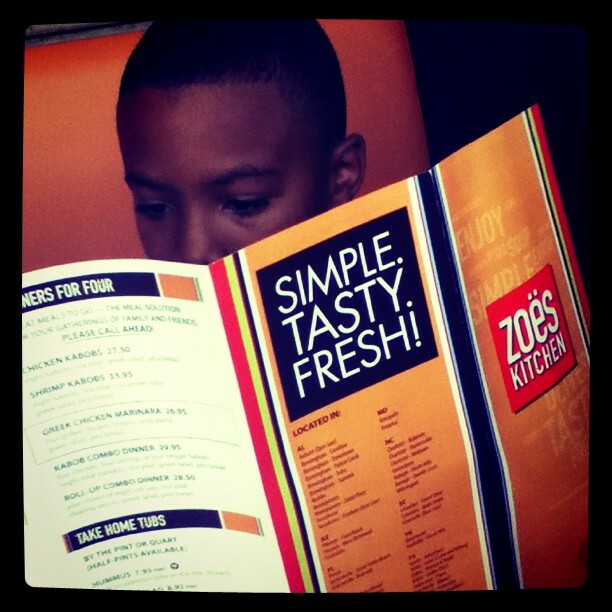 Zoës Kitchen is a great place for a family outing. If you're looking for a healthy alternative to dining or to enjoy mediterranean food, I would give this place a shot. It may help that they play cool music and have free wi-fi. That, for me, is always a win. 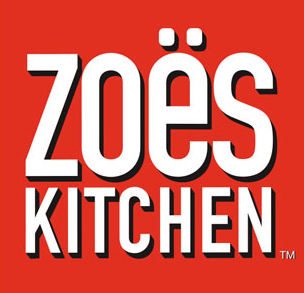 To find out if there is a Zoës Kitchen near you, check their locations. They even cater. 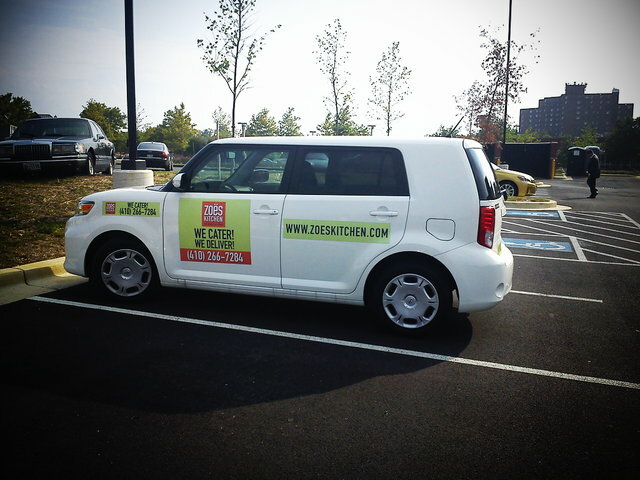 Call for your next party or event. Disclosure: I was provide complimentary meals for my family (and paid for some because my family grew over the weekend...lol). The opinions and views are my own.